Herbert Watts long tosses in warm-ups in preparation to take on John Curtis in Victory. 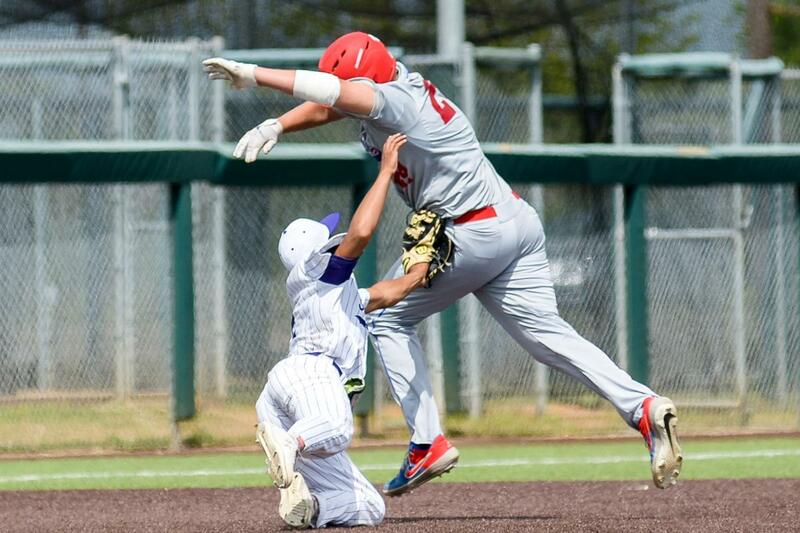 Coming off of a big win over St. Augustine Thursday night, John Curtis was looking for a Catholic League sweep of the Purple Knights Saturday. St. Aug had other ideas. The Purple Knights rallied with four runs in the bottom of the sixth inning to edge Curtis 4-3 at Wesley Barrow Stadium Saturday. In the big inning, Michael Mims singled home a run before Jordan Vidato tied the game with a two-run triple down the third base line. Kenya Huggins then doubled to left, producing the winning run to provide the margin of victory. Mims, who has signed with Grambling, was the star of the game with three hits and an RBI and he pitched a complete game four-hitter, striking out three. The win was the first ever on the diamond for St. Augustine over John Curtis, the two-time defending Division I state champion and three-time defending District 9-5A champion. The Patriots got out to the lead early with single runs in the first and second innings with Dax Ford and Richard Woodruff each driving in a run to make it 2-0. Mims then kept the Patriots scoreless over the next three innings before the Patriots added to the lead in the top of the sixth on a sacrifice fly by Michael Curtis to lead 3-0, setting the stage for the St. Aug rally in the bottom of the frame. In the top of the seventh Mims walked Amir Phillips but retired the next three hitters to preserve the hard-earned victory. Woodruff had two hits and an RBI for the Patriots. St. Augustine (11-8, 1-3) will be back in action against Archbishop Shaw Tuesday at 6:30 p.m. Winterscheidt Stadium while John Curtis (9-11, 2-4) will host Jesuit Monday at 7 p.m. at Mike Miley Stadium. This story was originally written for and published on crescentcitysports.com.